In this post we examine 5 of the best-selling rotary cheese graters. These hand-turned, manual cheese slicers are utilitarian throwbacks- highly functional for family pasta dinners. Indeed, these rotary cheese graters are handy kitchen devices (Source). A block of hard cheese goes in and a spinning, circular grater shreds the cheese. To keep everything in place, these devices unfold on a hinge (Source). When the cheese is in place, you fold this hinge shut. This holds the cheese in place with an arm. While we're examining rotary, manual graters, there are some electric cheese graters that will do the work for you. They turn on with the press of a button or flip of a switch to start them (Source). The grated cheese will fall out of the center of the hollow grater. This allows you to grate over a plate without any mess or struggle. These graters also usually come with a few different sized blades. For buyers, this allows you to buy one product and still have plenty of versatility. Customers had a few important notes when it came to these rotary cheese graters. First, metal cheese graters generally last longer than plastic options. They also noted that if you want your grater to last a long time, you are going to need to make sure to clean it well. The first noticeable difference in that cheese graters is their material. Both the ALISKID and Lovkitchen models are stainless steel rotary cheese graters. This makes them the more durable options. The GEMAG, Westmark, and Zyliss cheese graters have plastic housing. While they may not be as durable, these are the better priced and lighter choices.There are a few options that give you more than one grating drum as well. Each of the Lovkitchen, ALISKID, and Westmark choices come with three grating drums. The GEMAG and Zyliss options, though, only come with one grating drum size. When you are buying a new device, a warranty is usually a good idea as well. The ASKLID, Lovkitchen, and GEMAG options all have a lifetime warranty and service. They are willing to help you no matter what type of problem you run into. The Westmark and Zyliss cheese graters come with a 5-year warranty. While this is less, you should be able to get the hang of your new device in that time. You will also be able to tell if there are any manufacturing mistakes within the first 5 years of use. If you’re looking for a top-rated rotary cheese grater, you might want to consider the GEMAG multi-purpose shredder. Users love the usefulness of this cheese grater and so far have no complaints. This product is made of high-quality stainless steel drum with an ABS base and handle. The manufacturer states that its large, comfortable handles and ingenious design make it easy to use, even for those with weaker grip or small hands. This item might be a good choice if you’re looking for a stainless steel grater that will help you to quickly grate hard cheese, carrots, cucumbers, nuts, and much more. In general, buyers have a favorable opinion of the GEMEG handheld cheese slicer. They agree that it is super easy to use and clean. Most of all, they love that it is time efficient. Users state that there are no issues with dishwashing the unit. So far, there are no complaints about the product. With a rotary cheese grater, you have far less of a chance of accidentally cutting yourself while you work. You can have fresh grated cheese whenever you want so you don't have to buy bagged grated cheese. If you want to get creative, you can even use these graters on vegetables or even chocolate. These also aren't messy graters like box graters. You can shave cheese right over a plate without any problem. The Lovkitchen rotary cheese grater is a solid option if you want one with a smooth rotary mechanism that is suitable for both right-hand and left-hand use. Users like the handiness of this kitchen tool, but some do complain about a design drawback that might make it hard to grate. This product is a multi-purpose grater that comes with 3 different rotary drums that you can interchange for either fine grating or coarser grating of your ingredients. It is made of food-grade stainless steel and, as the manufacturer boasts, it is easy to clean and dishwasher-safe. This item could be a solid choice if you want a shredder and zester that is easy to store in small cabinets. In general, users state that the Lovkitchen shredder with 3 interchanging rotary drums meets their expectations. They agree that it is a wonderful kitchen tool that is well-made and sturdy. Buyers appreciate that it is easy to operate, as well as that the drums are easy to change. However, some complain about its design which makes it uncomfortable to hold the handle properly because your fingers can get nicked by it as you rotate it. Therefore, as they state, you might need to hold it in an awkward position to grate quickly. The Zyliss rotary cheese grater could be a good option if you want a kitchen tool that is designed to grate more cheese in less time while being comfortable to use. Users like the usefulness of this cheese shredder, but some do complain that it’s not suitable for any cheese other than parmesan. 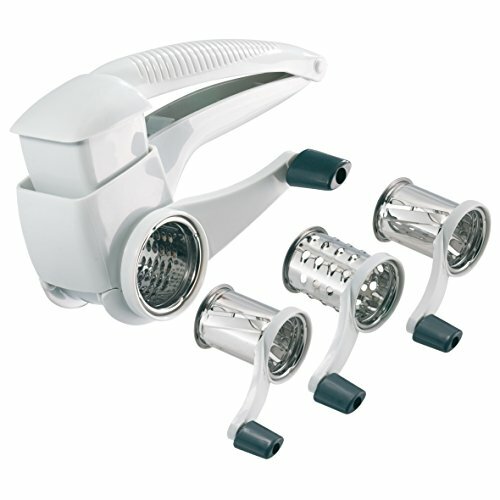 This product is a rotary cheese grater that enables you to grate more hard cheese, nuts or chocolate in less time. It features a stainless-steel drum and a sturdy plastic housing. Other features include ergonomic grip, removable parts for fast cleanup and compact storage in a cupboard or drawer. This item might be a good choice if you are looking fora dishwasher-safe cheese shredder. The general user consensus concerning the Zyliss classic rotary cheese grater is that it is a great kitchen tool for effortless grating. Many buyers state that it is easy to clean. They praise its comfortable handle too. However, many buyers complain that this item is only useful for grating truly hard cheeses, such as parmesan. They suggest looking elsewhere in case you need it for semi-hard or soft cheeses. There are many disappointed buyers who state that cheddar and Monterey jack cheese gummed up on the outside of the drum making the grater nearly impossible to clean. 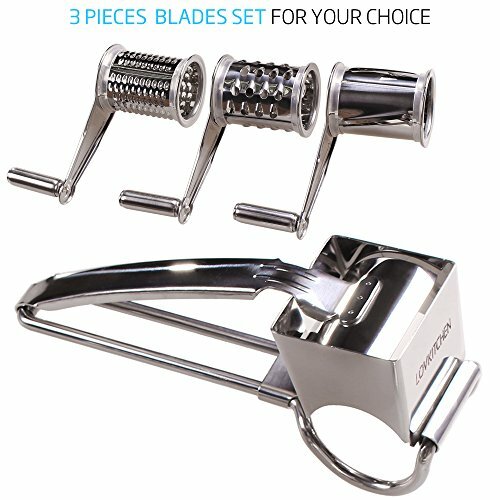 If you are looking for a rotary cheese grater, you might want to consider the ALISKID cheese grinder with 3 drum blades. Users like the handiness of this cheese grater, but some do complain about difficulties with using it. 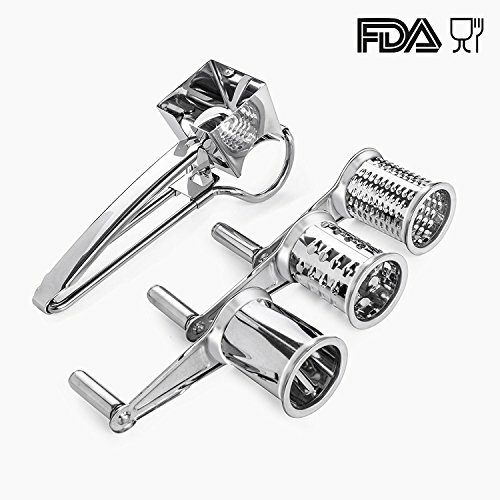 This product is a rotary cheese grater that comes with 3 different interchanging ultra-sharp rotary cylinders made of food-grade stainless steel. The drum is said to be suitable for grating ingredients such as hard cheese, parmesan, chocolate, nuts, etc. This product might be a good choice if you are looking for a sturdy and durable cheese grater. In general, users have a good opinion of the ALISKID stainless steel cheese cutter and they conclude that it is sturdy and very easy to use. However, some users complain that the tool is not very comfortable to use for people with small hands. There are some who state that the unit is flimsy. The Westmark multipurpose rotary grater might be a solid option if you want a high-quality kitchenware. Users like its efficiency, but some do complain about cheap plastic materials. This product features three different high-quality stainless steel drums for three different types of grating – one for coarse grating, one for fine grating and one for cutting and slicing. According to the manufacturer, it is efficient and comfortable to use. If you want a rotary cheese grater that can be left/right convertible by simply switching the placement of the drum, this item might be a solid option. In general, users state that the Westmark rotary cheese and vegetable shredder is very easy to use and simple to wash. However, there are buyers who complain that the tool is made of poor quality flimsy plastic and that it is not very durable.One online reviewer advises being careful using the unit, as it seems like it could be easily broken if too much force is applied. 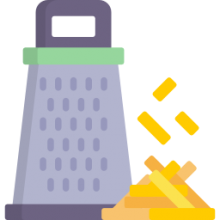 Since we spent so much time examining the pros and cons of using manual-powered cheese graters, we thought it would make sense to discuss buyer experience using them, as well. There are some different style options whether you are looking for a Parmesan cheese grater, a stainless steel option, a classic-style option-though we would be remiss if we didn't mention that there are electric alternatives, as well. However, the benefits to choosing a manually powered grater is that it's not going to break down, you can use it where there is not a reliable power source, and they're generally cheaper. One of our favorites was the Zyliss rotary option. The manufacturers promise that it will handle nuts, chocolate as well as hard cheeses inside of it stainless steel drum that is built inside of a plastic housing. If you need to open it up to clean it you just need to turn its handle counter clockwise- it can get stuck so you don't want to force it. If you are left-handed, it'll basically function upside down. You can't actually switch the rotary handle to the left side. When you’re exploring for the very best deal, you can purchase these at Home Depot, Lowes, Target, Harbor Freight, Menards, Ace Hardware, Walmart, Walgreens, and perhaps Costco. One reviewer we interviewed told us that she likes it because it has a very granular grating drum- this is good if you want to grate your cheese into fine granules. He also commended how comfortable the handle is- it's pretty ergonomic and can be used for extended periods of time if you need to grate cheese for a family of six sitting down to a big pasta dinner. One reviewer did tell us that he has had some difficulty with it because it grates too fine for it and you end up having to scrape it all out. Another problem buyers observed is that when you reach the end of the piece of cheese, it has a tendency to slip through a space between the main body and the drum. What this means is you're not able to actually grate the entire cheese block. As a workaround, try cutting the cheese into triangles. This helps to facilitate the grating if you position the triangle with its tip pointing up. Buffalo mozzarella, Coulommiers cheese, caprice des dieux, Neufchâtel cheese, Rocamadour cheese, Abondance cheese, Maroilles cheese, Oregon Blue Vein, Beaufort cheese, Cabrales cheese, Chaource cheese, Laguiole cheese, Muenster cheese, Pecorino Romano, Rembrandt Gouda, Saint-Marcellin, Taleggio cheese, Tomme de Savoie, Cheddar cheese, Cottage cheese, Gruyère cheese, Livarot cheese, Morbier cheese, Stilton cheese, Cantal cheese, Irish Cheddar, Monterey Jack, Sharp cheddar, Banon cheese, Comté cheese, Gouda cheese, Grana Padano, Mahón cheese, Ranker Video, Saint Albray, Swiss cheese, Blue cheese, Danish Blue, Boerenkaas, Colby-Jack, Gorgonzola, Mozzarella, Parmigiano, Stichelton, Camembert, Provolone, Reblochon, Roquefort, Manchego, Vacherin, Havarti, Ricotta, Brie, Edam, and Feta. Another benefit, especially compared to flat graters, is that you're not going to scrape and shred your knuckles as you work a block of Irish cheddar over your family's meatloaf dinner. It will give you a bit of exercise, however, but that is what is meant by a manually powered rotary-cranking option- sort of like you are a homesteader. One of the final reasons why people endorse this option is because it is so much easier to clean. One reviewer describes having to scrape and chisel and scrub his old grater of all of its Parmesan cheese flecks. This was especially annoying and cumbersome once the cheese dried. This has held true no matter the type of cheese he has employed- whether it was mozzarella, Parmesan, cheddar or Colby. The best way to clean it, he tells us, is to disassemble its three pieces, wash them by hand using soap and then merely let them dry after dinner on a wash towel so you avoid rusting. If you are in the market to purchase one of these options, do a little research first, consult a comparison table at the top of the page and consider whether you want grater that will produce fine or shredded grated cheese.